Join us for a two-hour small-group Strengths for Students coaching session. After completing the Clifton StrengthsFinder assessment, we will explore what your greatest talents are, and how to develop and apply your strengths towards your future goals. This program is for UWM students. Undergraduate or graduate students are welcome! Advanced registration is required to ensure that you have time to complete the Clifton StrengthsFinder assessment before attending. 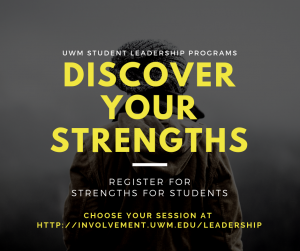 If you would like to schedule a custom Strengths session for your organization or staff, please contact Kirstin Demartino at leih@uwm.edu.